voltage drops below 10.5 V at 25±2ºC. cell (10.5V for 12 volt battery) at 25±2ºC. percell (8.4 volts for 12 volt battery). Specification Chart on pages 14-15. 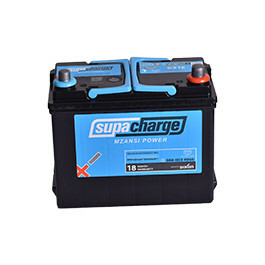 This Supa Charge Dixon Battery is low maintenance acid battery, due the fact that it has fewer plates per cell making it an economically affordable battery for all classes of vehicles. It has a standard taper Positive and Negative terminals. Polypropylene container with built in polypropylene handle, Base hold down class B6.